Costa Rica is one of the best honeymoon destinations in the world, where newlyweds get to choose from scenic beach resorts, unique lodges surrounded by pristine nature preserves, and luxury spa getaways. Explore the beautiful Manuel Antonio National Park, visit the attractions in the Costa Rican capital, San Jose, stay in a hotel overlooking Arenal Volcano, or check into a resort in the heart of the lush Costa Rican jungle. Here are the best Costa Rica honeymoon vacations. 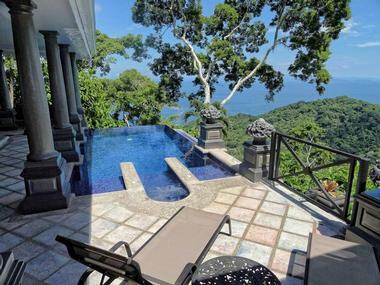 Located in the picturesque Manuel Antonio just steps from the magnificent Manuel Antonio National Park and surrounded by unspoiled, lush tropical vegetation, The Preserve at Los Altos is a luxury hotel and vacation rental that offers the ultimate getaway for families and groups and a range of services and activities. This all-suites hotel provides guest with extraordinary amenities such as elevator to the private entrance to the suite, a concierge, a spa with an ocean view, spectacular ocean views or the views of the surrounding jungle, an infinity pool, a private beach, a gourmet restaurant, and much more. The rooms are beautifully decorated and equipped with all modern amenities. Take a hotel shuttle down to the secluded beach, enjoy pampering at the spa, or let the resort organize a day of typical Costa Rican activities such as kayaking, zip-lining, horseback riding, white water rafting, visit to the Manuel Antonio Park, sunset cruise, and much more. Read more and find more honeymoon ideas. Imagine a beautiful Victorian palace with just a touch of Neo Classical style rising out of the lush tropical jungle. 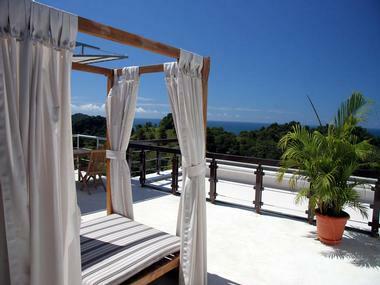 Hotel Villa Caletas is a surprising sight on the top of the forested hill above the Pacific Ocean. 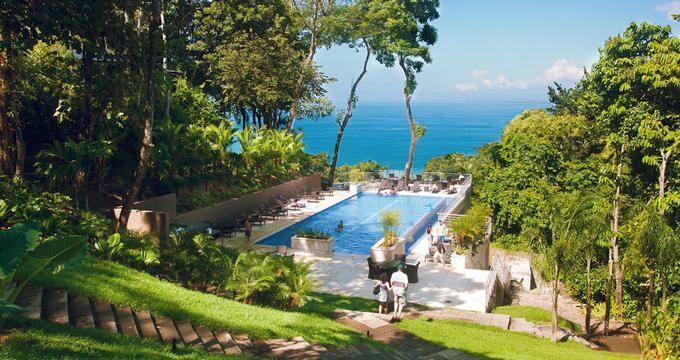 Located close to Jaco on the Central Pacific coast of Puntarenas, this quirky luxury hotel enjoys spectacular views of the ocean, miles of lush tropical forests, and a fine sandy beach secluded in a cove below the hotel. All rooms are beautifully decorated and full of original art, and they range from standard rooms and luxury suites to private villas. The amenities in some suites include private balconies and secluded private pools. The hotel has three great restaurants, including the luxury gourmet Mirador and Anfiteatro, located in a Greek amphitheater overlooking the ocean, and El Pelicano on the beach. Overlooking the lush tropical jungle of Manuel Antonio National Park and just a stroll away from Manuel Antonio’s two most spectacular beaches (Espadilla and Playitas), Arenas del Mar offers extraordinary luxury from its ideal location in the midst of lush unspoiled nature. It is designed for total comfort but with the environment in mind. 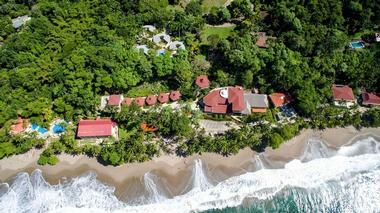 This is the first luxury hotel in Costa Rica to be given a Five Star Award and the Five Sustainability Leaf Award. The hotel’s thirty-eight luxurious guest rooms and suites are beautifully appointed and decorated with tasteful tropical touches, and they feature all modern amenities contemporary guests expect – luxury bathrooms, air-conditioning, flat-screen TVs, balconies, and spectacular views. Guests enjoy fresh, locally sourced meals at the Mirador restaurant or tropical cocktails on the Playitas restaurant and bar, right on the beach. Las Brisas wellness center is there to offer rejuvenating treatments and a bit of special pampering. Imagine waking up every morning to the sight of a huge volcano cone looming in the distance, threatening but beautiful, dormant but very much alive. Springs Resort and Spa is located just outside of the Arenal volcano’s “danger zone” a thousand feet above the beautiful verdant Arenal Valley with a view of distant towns that sparkle in the night. The proximity to the volcano offers guests of this luxury resort the abundance of thermal springs that fill twenty-eight hot mineral pools. 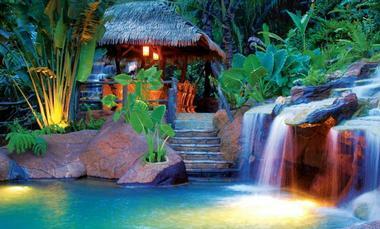 It is surrounded by lush tropical gardens and has a 14,000 square foot full service spa and fitness center. All hotel rooms, whether they are standard, suites, villas or bungalows, have private balcony and the view of the volcano, hammocks, air conditioning, luxurious bathrooms with Jacuzzi, and so much more. There is a range of restaurants where guests can discover cuisines from all over the world. Alta las Palomas is a luxury boutique hotel near San Jose, the Costa Rican capital, with breathtaking views of the Sun Valley and surrounding tropical nature. All 23 rooms and spacious suites are modern and luxuriously appointed. Suites have their own balconies and gardens and total privacy. All rooms have private bathrooms and modern amenities. Guests can enjoy gourmet meals at the popular La Luz restaurant bar and lounge, which has live music twice a week. The hotel has a large outdoor swimming pool and whirlpool, as well as a small gym and sauna. The hotel is very popular with business travelers who can take advantage of the hotel business center, conference room, and library. Located in an elegant Italianate villa surrounded by verdant tropical gardens, Resort Martino is a five-star luxury hotel that can serve as a perfect base for your exploration of the Costa Rican central valley rich in natural diversity, volcanoes, coffee plantations, and tropical beauty. Just a short drive from the Costa Rican capital San Jose, Resort Martino has forty Luxury Suites and sixteen Deluxe Suites and Villas, all with their own balconies and views of the spectacular six acres of tropical gardens. 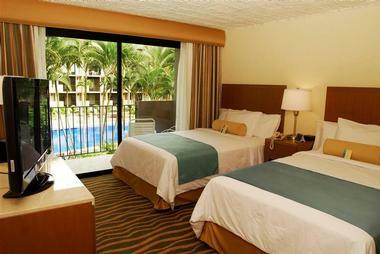 All rooms are superbly decorated and appointed, featuring a lovely mix of European charm and Costa Rican hospitality. The hotel has a large outdoor pool in the garden, a spa, a fitness center, and a gourmet restaurant that offers local and Italian cuisine. 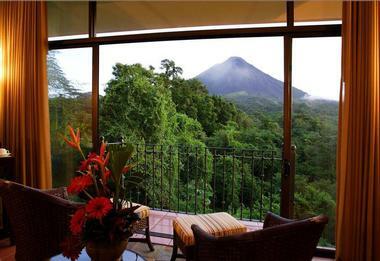 Arenal Kioro Suites & Spa offers you a front seat view of the magnificent Arenal Volcano. Each of the fifty-three luxury suites has views of the slopes of this imposing volcano that emerges majestically from the surrounding Arenal National Park. 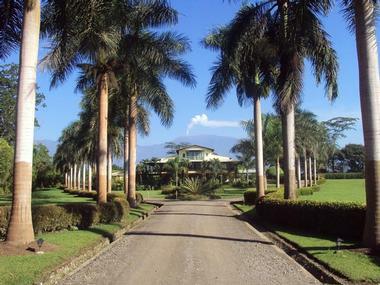 Arenal Kioro is surrounded by twenty-seven acres of lush gardens that are intersected by two cool streams. Thanks to the volcano, thermal waters fill seven hot spring pools that hotel guest will surely appreciate. All suites are luxuriously furnished and appointed with private en-suite bathrooms featuring a hydro massage hot tub and modern amenities. The restaurant of the hotel offers gourmet food that features local and international cuisine prepared by an award-winning chef. 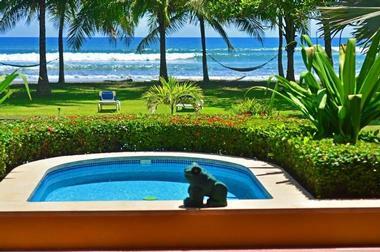 Learn to surf at the beautiful Cariblue Beach & Jungle Resort located in the middle of the lush Costa Rican jungle where the rolling waves of the Caribbean Sea rush against the fine sand beaches of Talamanca. This luxury resort is located on five verdant acres of unspoiled tropical forest providing shade from ancient trees and a home to hundreds of wild animals and birds. 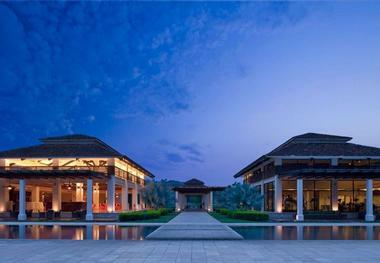 The resort has forty-five modern rooms that range from the popular standard rooms to opulent bungalows and suites. All are beautifully decorated with colorful local art and intricate mosaics. They also have private modern bathrooms, and many have balconies overlooking the flowering garden or miles of golden beaches. Guests can enjoy two outdoor swimming pools and two Jacuzzis, the gourmet restaurant Sole Luna, the quaint beach bar Totem, and much more. Even if you are not into surfing, you will have fabulous time surrounded by magnificent nature and unparalleled luxury. Puerto Viejo is one of Costa Rica’s best-kept secrets - a jewel of a town on the Caribbean Sea. This colorful, wild place has been a magnet for divers and backpackers for years. Banana Azul offers luxury accommodation that is uniquely Costa Rican, deeply immersed in nature, built of native materials, and decorated with original native art. Each room is unique, and many of them have private balconies and porches. All rooms have private bathrooms that will delight you with interesting details and materials. While rustic and colorful, all rooms are modern and comfortable and have contemporary amenities. You will also get total privacy, access to the teeming surrounding jungle, and as much entertainment as you wish, whether you are looking for it on the fine sandy beaches, in the lush garden of the hotel, or on the quaint streets of Puerto Viejo with their bars, restaurants, and shops. More vacation ideas for couples. 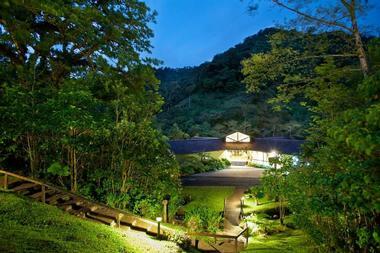 Get close to nature in the lush tropical Costa Rican wilderness in Rafiki’s luxury tents. Rafiki Safari Lodge is a wilderness camp that redefines camping as you know it. Located along the beautiful Savegre River about 30 km from Quepos on the Pacific Coast, the lodge and the camp are set in a true tropical jungle on 842 acres of spectacular nature teeming with wildlife. Ten tents are situated on individual wooden decks high off the ground with full bathrooms, private porches, and rocking chairs. Completely immersed in a lush tropical mangrove forest, El Mangroove is a luxury resort located in the northwestern coastal region of the Costa Rican Guanacaste province. Protected by the secluded Papagayo Bay and stretched out across seventeen acres of gardens and wild forest, the hotel offers guests the privacy of 150 meters of spectacular Panama beach. The hotel’s eighty-five luxury suites offer all modern amenities and comfort, from private baths and sitting areas to flat-screen TVs. The hotel’s design seamlessly blends indoor and outdoor spaces. All suites have outdoor access, balconies, and patios. The hotel’s two restaurants Makoko and Matiss beach bar offer guests gourmet cuisine and international and local drinks. 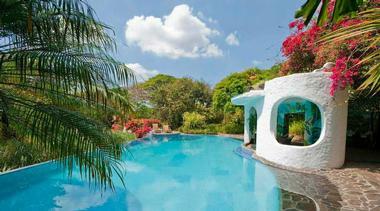 A large pool is surrounded by lush vegetation, and the beach is just steps away for a swim or leisurely stroll. The hotel is perfectly situated to provide a great starting point for the tours of Guanacaste volcanoes, waterfalls, hot springs, and national parks. Quaint little nearby town of El Coco has lively bars, restaurants, and shops. Hotel Makanda by the Sea seamlessly merges 5-star luxury and comfort with a spectacular surrounding tropical nature. 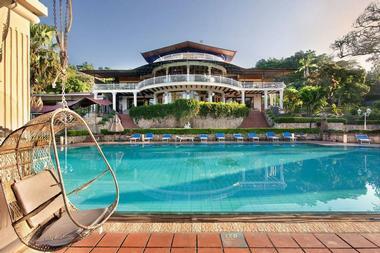 Located on Costa Rica's southern Pacific coast near the magnificent Manuel Antonio National Park, Makanda Hotel is an adults-only oasis of opulence. Here, spacious villas are snuggled in the lush jungle to provide ultimate privacy with indulgencies such as private Jacuzzis or infinity pools. All villas are beautifully decorated with local art and intricate woodwork and have luxurious bathrooms, terraces, and never-ending views. Enjoy close encounters with sloths, monkeys, toucans, and parrots, go to the secluded little beach nearby, indulge in the hotel’s gourmet poolside Sunspot Bar & Grill, or take a stroll through the ancient surrounding jungle. High in the mountain highlands of the Costa Rican central valley, lies the luxury inn and coffee plantation Finca Rosa Blanca. Even though the inn is located only a short drive from the Costa Rican capital San Jose, there is a sense of privacy and seclusion that will make you instantly feel relaxed and tranquil. 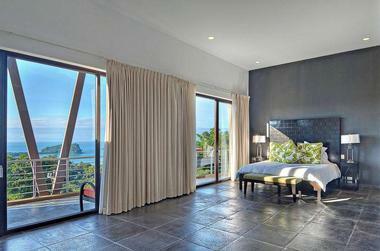 The inn has three luxury Master Suites and Villas and eleven Junior Suites. Most of the beautifully decorated rooms have Jacuzzi baths and king-size beds. You will feel the ultimate sensory thrill when enveloped in exquisite natural linens made of bamboo fibers. 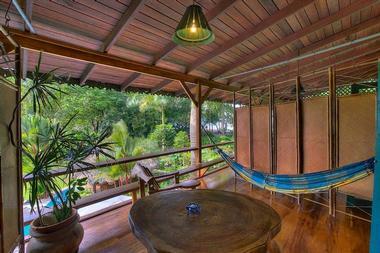 Rooms have private balconies overlooking the lush surrounding greenery. The Finca Rosa Blanca will delight you with its unique architecture, original native art, and healthy, thriving coffee plants that grow all around you in this functioning coffee plantation. El Silencio Lodge & Spa is the place where the only sounds that break the silence are cries of birds, chirping of frogs, and an occasional howler monkey calling its mate. High up in the Costa Rican central highlands mountains under the shadow of a volcano and surrounded by ancient cloud forests nests this beautiful luxury lodge that is designed for privacy, romance, and seclusion. There are no tennis courts or swimming pools – just peace and unspoiled nature. 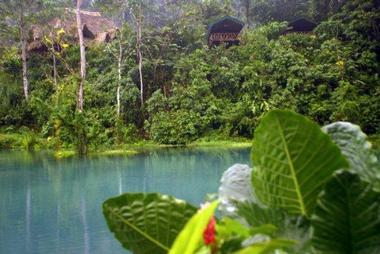 Fourteen luxury suites offer total privacy and spectacular views of the surrounding jungle and mountains. All rooms have private decks, heated jetted pools, and exquisite décor rich with local art. Indulge in this wonderfully romantic spot where you can get close to nature while being wrapped in opulent luxury. 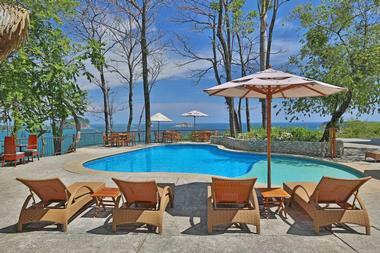 You may also like: Playa Cativo, a Secluded Honeymoon Vacation in Costa Rica. Located on the wild Nicoya Peninsula on the Costa Rican Pacific coast, Tango Mar is an exclusive luxury resort surrounded by 150 acres of lush vegetation, unspoiled jungle, and exquisitely landscaped gardens. You can enjoy miles of private beachfront and listen to the constantly breaking waves that have been delighting surfers for decades. Whether you come to surf, escape from it all, or treat your family to the ultimate adventure, Tango Mar will provide you with luxury and comfort that will make you forget all the stress of everyday life. You can choose one of the beautiful tropical suites surrounded by the lush garden, a private beachfront villa just steps from the fine golden sands, or any of the other luxuriously appointed rooms with traditional Costa Rican hand-crafted furniture made from the wood grown on the resort’s own grounds. You can go scuba diving, fishing, hiking to the magnificent waterfall, go horseback riding along the beach, or lie by the cool pool and do absolutely nothing. This is the land of Pura Vida. 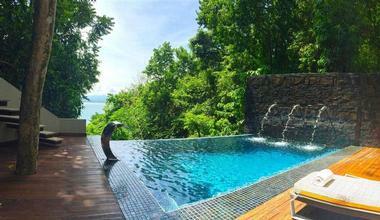 Just a short walk from the ancient jungle of Manuel Antonio National Park, Gaia Luxury Boutique Hotel and Reserve is snuggled on the side of the hill overlooking the ocean, surrounded by lush vegetation on all sides, and terraced to allow each suite and villa endless views of the Pacific below. This modern 5-star eco-friendly resort is a luxurious getaway that blends modern amenities, total comfort, and lush unspoiled nature full of wildlife. All guests can enjoy fine dining in the hotel’s on-site restaurant, luxury spa and gym, and several swimming pools. The hotel is located on the site of the original Gaya Garden and has a large number of rare plant species and endangered orchids. 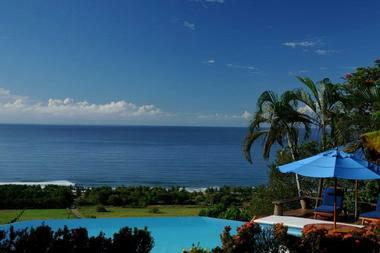 Punta Islita is a place that will give you the full Costa Rican experience. Everything is included: eco-adventures, jungle expeditions, horseback riding, canopy zip-lining, sea-turtle expeditions, cooking lessons, golf clinics, art sessions, and so much more. You will also enjoy a beautiful luxurious room, a suite, or a private villa. All rooms are spacious, modern, and wonderfully appointed with local art, tropical colors, and lovely terraces overlooking the garden or beach. The highly acclaimed Pacifico restaurant offers magnificent ocean views and gourmet meals that focus on fresh local produce, fish, and seafood, fusing international and traditional Costa Rican cuisines. Punta Islita is a great place for a honeymoon, a family vacation, a place to renew your vows, or celebrate anything in between. If you cannot decide whether you want to relax or explore in Costa Rica, Discover Blue River Resort & Hot Springs is the perfect choice, as it allows you to do both. Located on the northern slopes of the majestic Rincon de la Vieja volcano, this luxury resort is surrounded by the lush rain forest with imposing waterfalls, mineral hot springs, and cool blue volcanic rivers. You can swim in the hot springs, wander through the botanical garden with 700 exotic plant species, visit the fish and turtle ponds, a hummingbird sanctuary, butterfly gardens, or the soothing and rejuvenating spa, or take off on one of many eco-adventures. And when you come back, rest in the comfort of the resort’s luxury cabanas snuggled in the tropical garden fully equipped with all modern amenities and decorated with local art and crafts. Casa Turire is located in a beautiful Spanish-style structure that can easily make you imagine how life looked during colonial times. Cozy courtyards, colorful tiled floors, and antique art pieces make Casa Turire a charming, nostalgic retreat from the stress of everyday modern life. Surrounded by lush, fertile agricultural lands on the bank of La Angostura Lake and shadowed by the Turrialba Mountains, Casa Turire is perfectly positioned to be your starting point for exploring the rest of Costa Rica. Enjoy one of the hotel’s twelve regular standard rooms, three spacious Suites, or the luxury Master suite. 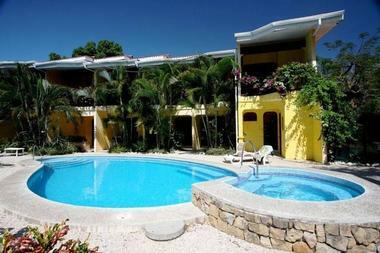 All rooms have their own balcony overlooking the gardens and a pool, and have modern luxury amenities. 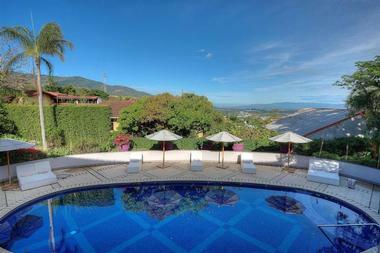 Take a tour of the nearby plantation, kayak on the La Angostura Lake or relax by the pool. The hotel offers Costa Rican and international menus at their pleasant patio restaurant and original cocktails at the American-style well-stocked bar. High up on the top of the hill overlooking one of the most spectacular Costa Rican beaches is the charming Cristal Azul Hotel with four quaint cabins that can accommodate a maximum of thirteen guests. This is a true private retreat where you can enjoy the surrounding nature, listen to the birds and monkeys, swim in the beautiful infinity pool, or take endless walks along the fine sandy beach. Cristal Azul Hotel is located on Nicoya Peninsula on the Pacific coast of Costa Rica, along an undeveloped stretch of the coast where you share your space with wild nature and very few people. Tortuga Lodge is located on one of the most beautiful, wild, and inaccessible parts of Costa Rica on the country’s northeast coast in the middle of Tortugero National Park. The park protects 51,870 acres and is one of the most biologically diverse areas of the Central American tropical rain forests. Tortuga Lodge hugs the bank of the Tortugero River, and the only way to get there is by boat or light plane. There are twenty-seven rooms with spectacular views of the river, and they are rustic but comfortable and luxuriously furnished and appointed. Some have lovely private balconies. You can choose a room without air-conditioning if you want to enjoy the clean river breezes and listen to the sounds of the surrounding jungle. There are no TVs and no background music in the hotel, allowing guests to enjoy the seclusion and tranquility. Visitors are treated to traditional Costa Rican dishes like a treasured guest in a local home. Tours of the lodge’s gardens and surrounding Tortugero Park as well as kayaking on the river are a wonderful way to get to know the lush nature around. Costa Rica is not all jungles and waterfalls. Best Western Irazu Hotel & Casino is located in downtown San Jose, the modern cosmopolitan capital of Costa Rica. It offers all of the facilities and conveniences that make you feel at home. 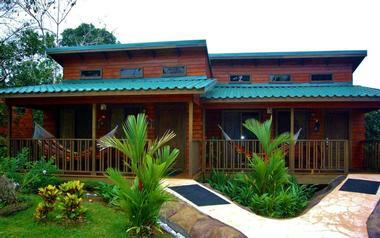 The hotel is ideal for business travelers or for tourists on the way to Costa Rican adventures. Rooms are modern and spacious, well-appointed and featuring private en-suite bathrooms. Enjoy the hotel’s lush tropical garden with swimming pools, tennis courts, casino, gym, two restaurants, spa, and much more. Full conference and business facilities make Best Western Irazy the perfect place to conduct your business in Costa Rica while surrounded by luxury and beautifully landscaped nature. Alma del Pacifico is located right on the Playa Esterillos Este beach where miles of golden sands meet the endless expanse of the Pacific Ocean. This luxury hotel is a veritable art gallery of renowned artist Charlene Broudy, who designed the hotel and decorated its private beach villas with more than 150 pieces of original art. Colorful villas are surrounded by lush tropical vegetation and are connected by narrow, pleasant paths that invite visitors to take a leisurely stroll among bright blooms where macaws, iguanas, and butterflies make their homes. Each of the twenty-four luxury private villas has direct access to the beach or to the garden and is unique in design, color, and amenities. The hotel’s guests enjoy a thatched roof open-air restaurant and bar that serves gourmet meals featuring international and Costa Rican cuisine. The hotel’s sophisticated seaside spa offers a range of natural therapies. 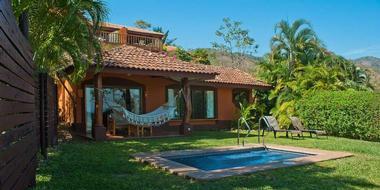 Reserva Conchal is the jewel of the Guanacaste Region. Overlooking the Catalinas Islands and some of the finest beaches in the country, it is an enclave of luxury and style nestled between the lush Costa Rican tropical forests and the endless expanse of the Pacific Ocean. The 2,300-acre resort exists in perfect harmony with its surroundings, as it is designed to take advantage of it without destroying it. Guests are offered extraordinary amenities in this all-inclusive Westin Hotel such as beautifully decorated villas and private residences, a world-class 18-hole championship golf course, a private beach club, and the ultimate word in pampering at The Spa, Playa Conchal. Hotel Giada has it all: it is located in Playa Samara in a secluded bay on seven km of white sandy beach and surrounded by lush unspoiled jungle, and it is heaven for nature lovers, surfers, sun-worshipers, and just about everyone else. While the barrier reef protects the town and hotel from the strong Pacific waves, surfers can go just a bit outside of the bay to enjoy some awesome rollers. 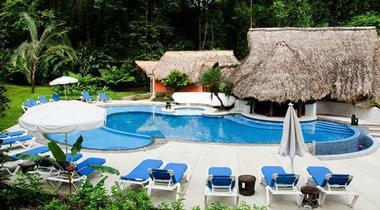 The hotel is a little Costa Rican oasis of luxury surrounded by colorful tropical jungle. Guests can enjoy twenty-four comfortable modern rooms with private bathrooms, and they are nicely decorated in tropical colors with fine details. You can choose an air-conditioned room or enjoy the clean salty breeze from the sea. Surrounded by the hotel gardens are two pools and a Jacuzzi, as well as a bar and restaurant where you can sample some delicious Italian or local dishes, tropical cocktails, or good wine. AmaTierra is an all-inclusive retreat and wellness center in Costa Rica's lush Turrubares Valley, approximately one hour west of San Jose. The immersive retreat, which is located at an altitude of nearly 2,000 feet within a beautiful Costa Rican hardwood forest, strives to cater to visitors' minds and bodies alike, facilitating relaxation and rejuvenation through a variety of holistic health practices. Daily Hatha yoga courses are offered for participants of all ages and ability levels, with free meditation classes encouraging participants to disconnect from the grid and practice mindfulness principles. Participants can also detoxify with the aid of professional nutritionists and herbalists and enjoy delicious farm-to-table meals prepared with organic, locally-sourced ingredients. Three, five, and seven night all-inclusive stays are offered.